Last summer, Christian Lopez made headlines thanks to a combination of serendipity and one selfless act. He was in the right place at the right time when Derek Jeter knocked his 3,000th hit, catching the ball. In this age of auction riches, one would have assumed that Lopez would have used the ball to get out of debt and build a solid nest egg for the future. Nope. Instead he returned the ball to Jeter in exchange for a few pieces of memorabilia. The Yankees also pitched in seats for the rest of the season. Once word of Lopez's actions got out, several corporate entities came on board to reward him. Steiner Sports, Miller High Life and Modell's all made deals with him and helped take care of some of Lopez's student loans and tax debt resulting from the memorabilia and tickets he received. 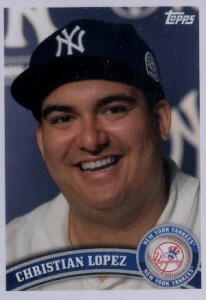 Topps also pledged to make a baseball card of Lopez, perhaps the ultimate tribute for a baseball fan. That card has finally arrived as a suspected short print in 2012 Topps Opening Day Baseball. Made with the 2011 Topps Baseball design, the card features a photo of Lopez from a press conference. Topps has yet to confirm insertion rates for the card and whether it is, indeed, a short print. However, just two have popped up on eBay so far. Sure, 2012 Topps Opening Day has only been live officially for a couple of days. It's also an entry-level set targeted for retail and not really known for breaking and flipping. But since the card immediately stands out, one would think that if it were readily available more would be out. The first Lopez card sold for $25 via Buy It Now. A second is now listed with an opening bid of $9.99. Should the mainstream media get wind of the card, don't be surprised if it sparks a short frenzy. While it is something of a novelty card, it is connected with a significant moment of the 2011 season. 1996 (10) Pinnacle Rookie Lot Derek Jeter #171 cards. Nice investor set! 1996 Derek Jeter Score #240 (5) cards. All PSA 9. Nice Set of RC's! Opening Day? That’s the set they pledged to put him in? Did they tell him that ahead of time? Did they give him options? Pfffffftttt……… Still a bone head move IMO. Could have fetched $400,000 and payed off his student loans. Now he has to work off the debt for the rest of his life. Jeter should have told the kid to keep it like Maris did.